How does a bicyclist know if they have activated the light at an intersection? Once in a blue moon, you will find a sign, like here on the WWU campus, assuring cylists that there is a bicycle detector in pavement, but how does one know if they've tripped it or not? Maybe they could paint a sign on the pavement indicating where the detector is located showing the best place to put the bike so it can activate the detector. Pedestrians often have an audio cue to let them know when the walk button has been pushed. For instance the tone of a beeping button changes pitch. Then when the walk light comes on, some of them even say, "walk light is on," "walk light is on." 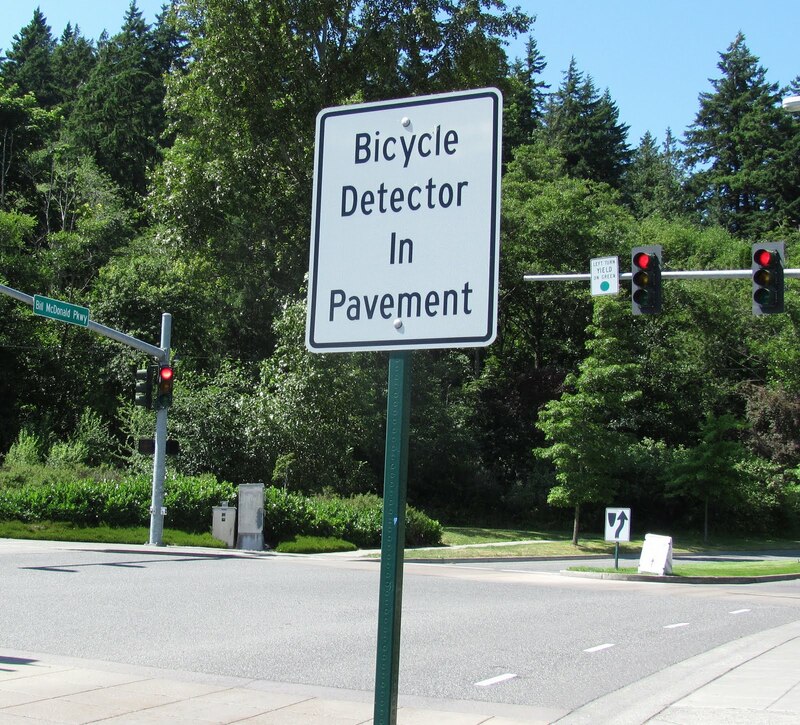 How about connecting the bicycle detector to that system so one can hear the change in tone when the detector has been activated? Maybe someone has already thought of this, but I might as well suggest it. Some walk light buttons have an LED light that changes color to indicate when the button is activated. That could be connected to the bicycle detector also. A cyclist can see this from the road without having to go over to the walk button. In some cities, bicyclists even have their own button to push right by the bike lane without having to cross to the sidewalk and push the walk button. This is real nice, but more expensive to install. It's rare to find that sort of set up. More commonly, the pedestrian walk button is not very accessible to cyclists, but the detection system that works for cars is supposed to apply to the bike also. Problem is, it's hard to tell if you, with your small bike, have actually been detected. I've seen some intersections with a bar that you line your bike up with that activates the light.